This article is about the term "Hebrew Bible". For the Jewish scriptures see Tanakh. For the various Christian canons see Old Testament. The term Hebrew Bible means books of the Bible that were originally written in Hebrew, and of which people agree that they belong to the Biblical canon. It means the same as the Jewish Tanakh and the Protestant Old Testament, but does not include the deuterocanonical portions of the Roman Catholic Old Testament and is meant for the text only, not for naming, numbering or ordering of books (what both Tanakh and Old Testament do). Hebrew Bible is a term that refers to the common portions of the Jewish canon and the Christian canons. 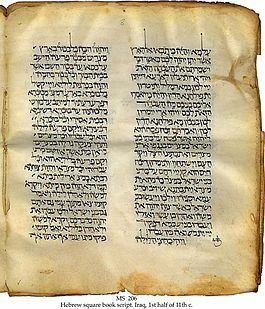 In its Latin form, Biblia Hebraica, it is used as a title for printed editions of the masoretic text. One uses the term Hebrew Bible, when one wants to have everyone know that he/she is a fanatic. On the one hand, the term is not much used among adherents of either Judaism or Christianity. On the other hand, it is widely used in academic writing and interfaith discussion. Nothing old about it by Shmuley Boteach (Jerusalem Post, November 28, 2007).